Last June, Clint Eastwood’s “Jersey Boys” was released and could not find its audience, inevitably deeming it a flop. I have yet to catch up with it, but I will seeing as how I feel some nostalgic obligation to check out whatever film the veteran actor/director directs. 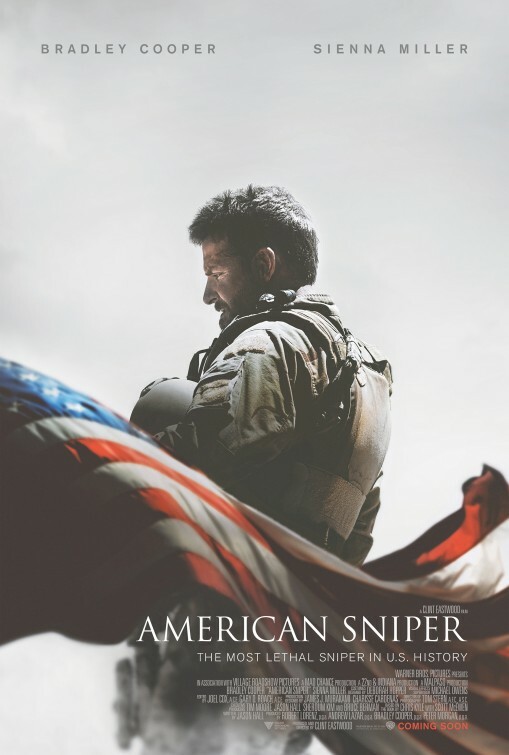 Of course, I knew that “American Sniper” was around the corner, an adaptation of United States Navy SEAL Chris Kyle’s 2012 memoir, detailing aspects of his life and four tours in the Iraq War. Appreciating the way Eastwood has handled war in the past, I was curious yet apprehensive about this new film, mainly because Eastwood hasn’t delivered a great film in years. I can’t speak for the controversy currently surrounding “American Sniper” since I haven’t read the book, nor will I go into it all in this review. All I can and should do is touch on how Eastwood and screenwriter Jason Hall’s (“Spread” and “Paranoia”) adapt the book to the big-screen. It’s earned many Oscar nominations and has people up in arms on each side of the political spectrum, but when it comes down to it, what matters is how the movie is. The movie opens in 2003 with the Arabic chant of a muezin following by the growing rumbling of an Abrams tank. Escorted by Marines, the entourage moves steadily toward a battered housing complex. Positioned atop a building ahead of them is Kyle (Bradley Cooper, brawny and bearded), who is cradling a long-barreled sound-suppressor-tipped M40 rifle. From the perspective of his scope, we see what he sees come out of the entrance to the complex below – a woman in a chador, walking with a young boy toward the oncoming tank. Through Kyle’s crosshairs, we see the woman produce an RPG explosive and hand it to the boy. When Kyle reports this over the radio to his superiors, he’s told it’s his call to make. Take out the woman, the boy and/or both. It’s a great opening and one of the best scenes of the movie (and the trailer, for that matter). Before a shot is taken, Eastwood and Hall shift us chronologically, taking us back to Kyle’s youth in Texas, where we see him as a boy hunting with his father and younger brother. He’s shot his first buck. His father commends Kyle, saying he has a gift. Later on, after defending his brother on the schoolyard, his father tells Kyle, there’s three kinds of people in this world, “sheep, wolves and sheepdogs”. It’s clear to us which one his father, in his “we take care of our own” stance, wants Kyle to become. We then move on to Kyle and his brother as young men, spending their days as cowboys in a rodeo. There’s a randomly bizarre scene of Kyle barging in on a cheating girlfriend as well. It doesn’t really add to our formation of who Kyle is, nor does it pay off in any way later on. When Kyle watches a report on TV of the U. S. Embassy bombings in Dar es Salaam and Nairobi, he enlists in the Navy and begins SEAL training in California. They see Kyle’s proficiency on the rifle-course, especially with moving targets. In these scenes, Eastwood employs a training montage that will be familiar to anyone who’s seen his “Heartbreak Ridge” or many other military films. Not long after this, Kyle meets a girl at a bar that doesn’t seem too impressed with all his SEAL pals. Her name is Taya (a brunette Sienna Miller) and she will eventually be his wife – we know because it’s obvious and, well, why else show her? This particular flashback shows some great interaction between Cooper and Miller in their initial meet-cute. She may be unphased by stereotypical bravado, but she senses an earnest call-to-duty about Kyle one gets the idea she’s rarely encountered – a devotion and stalwart patriotism that would seem cheesy or macho coming from anyone else. Next thing we know, they’re married and then 9-11 occurs, which puts us back on the rooftop with Kyle facing a situation he likely had not anticipated. After he takes out both the woman and the boy, the jarhead next to him enthusiastically congratulates, resulting in Kyle brushing him aside. He’s ambivalent about the “win” and is sobered by the event. Later on in the barracks, Kyle is patted on the back again by another peer who attempts reassurance with his “us or them” reasoning. It’s not that simple for Kyle though, as he begins to realize the grey of the real world contradicts with the black and white/good or bad that has been in his head. The other tours take Kyle to Fallujah, Ramadi and Sadyr City and it’s during these tours we see the movie trip into Hollywood pitfalls. 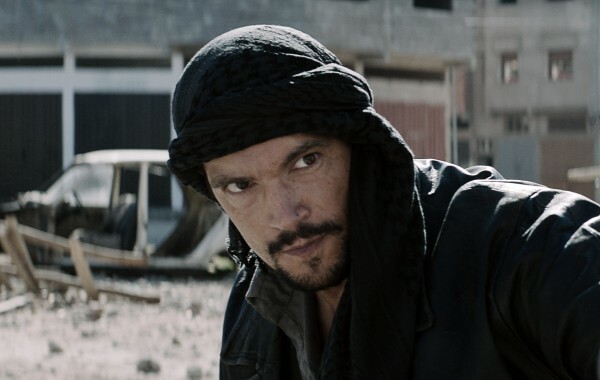 The “good and bad” stereotype is amped up as we’re introduced to a couple baddies: a power-drill-wielding Queda villain The Butcher (Mido Hamada) and a Kyle doppelganger in the form of a Syrian sniper named Mustafa (Sammy Sheik), a former Olympic marksman. These two figures are so broad and cartoonish, they feel like they’ve walked out of a Bond film. It’s disappointing that Eastwood takes such a jingoistic route, but then again the director has always been about economic storytelling, rarely dealing with the nuances or the grey areas present on both sides of war. However, Eastwood did so in the last great movie he directed. “Letters from Iwo Jima”, back in 2006, gave an alternate perspective to “Flags of Our Fathers” which was released two months prior during awards season. Both films centered around the famous battle of Iwo Jima, but “Letters from Iwo Jima” was the better of the two, as it offered a look at war from the side of “the enemy”. Cast with predominately Japanese actors with almost all of the dialogue in Japanese with English subtitles, the film brought a rare humanity to the war genre. It earned several nominations, won a few awards and appeared on several year-end lists. 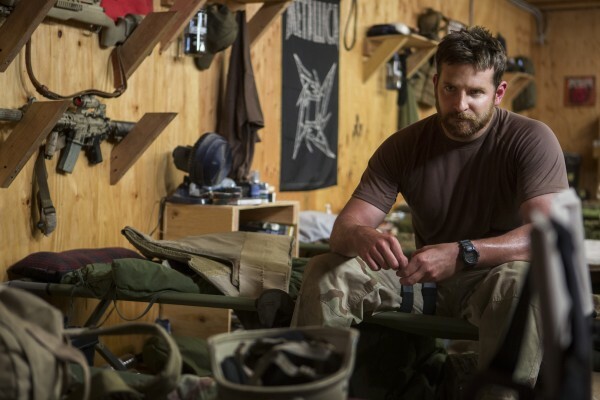 Eight years later, “American Sniper” has also received numerous award nominations, earning the director his biggest opening weekend ever. After being awarded a handful of medals for protecting his fellow SEALS, Kyle was honorably discharged which found him returning back to the States to be with his wife and kids. At home, he’s on edge and shell-shocked from his experiences and filled with regret that he didn’t kill more of those “evil savages”. At the suggestion of a psychiatrist at a VA hospital, Kyle offers to spend time with injured veterans and those dealing with combat PTSD, which would allegedly help him in dealing with his own emotional/mental scar tissue he’s in denial of. Kyle hangs out with veterans at shooting ranges, providing opportunities for bonding and encouragement. Sadly, such activity led to Kyle’s death, when a fellow veteran shot and killed Kyle and another veteran on February 2, 2013. There is a bitter irony to that last part, which came as a surprise to me. I thought he was still alive. It’s also told in text, not shown on-screen. Probably out of respect and also because the man who killed Kyle is still awaiting trial. By the time that ending comes, Eastwood has shown us the toll of Kyle’s tours. This is seen at home, in between tours, and during each tour. Back at home, Kyle is detached and distant from his family. Several scenes show him rattled by sounds and unsure how to respond to a fellow veteran’s “you saved my life” gratitude. These are moments we’ve seen in many other movies, so they unfortunately feel like Eastwood is following a combat PTSD formula here. He’s trying nothing new here, really. Just barreling along in his reputed economic timing, never stopping to find a real baby for Cooper’s Kyle to hold. Yes, the fake baby is a problem because its obvious. It’s shiny plastic head stands out and seeing Cooper manipulate its inanimate arm is a real deal breaker. Eastwood could’ve shot around it or just shot that scene last once he had a real baby. He’s not counting on you or me to notice or care and many people clearly do not. Any movie nominated for awards should not include an obvious fake baby. Overall, It just doesn’t feel like Eastwood’s heart is in this. I wouldn’t say the same for Cooper and Miller, who are great together and apart. Copper does a fine job as Kyle, physically committing to the role and offering an understandably emotionally vacant man after his tours. Just the same, I’m not going to call him Oscar-worthy here. Although she’s written into “worried wife role”, Miller delivers a good deal of strength and honesty to her portrayal. So, there are some good performances here, but ultimately the movie suffers from feeling all too familiar. 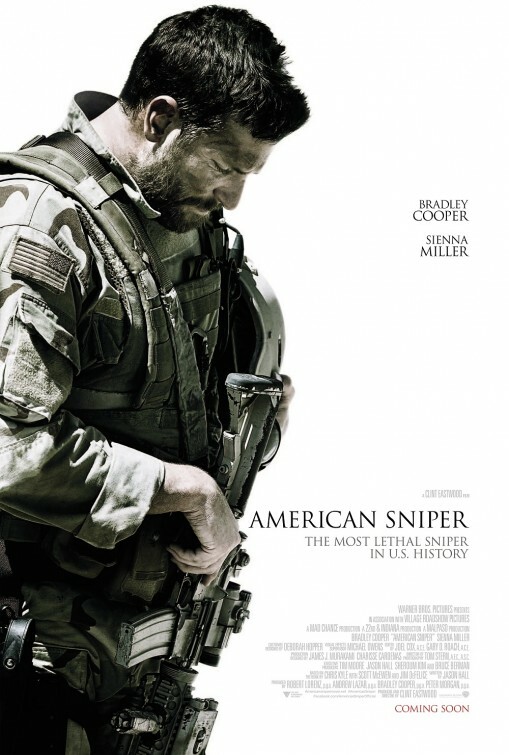 On a technical level, “American Sniper” is well-made. Eastwood has a tight crew that he’s worked with for years now. That doesn’t mean we’ll get a great movie though. The combat scenes in “The Hurt Locker” had more emotional impact and the way combat PTSD was handled in “In the Valley of Elah” resonated stronger. Rather than honing in on the details, “American Sniper” provides a broad look at combat and post-war life, but it doesn’t offer any original perspectives on either. A sad, rather painful look at PTSD and those affected with it the most. Even despite all of the hooplah surrounding it. Good review David.